Here are the dates for our next digital photography courses in the Derbyshire Peak District and on the edge of Sheffield for the next few months. They are all one day courses, in small groups (with a maximum of only 4 or 6 people), led by an experienced professional photographer with extensive local knowledge. You can read what some of our clients have said about our courses here on Google. More course dates are added on a regular basis, so if you would like to be kept informed of all the training courses we are running as soon as they are announced, please sign up to our newsletter. You can contact us to request a booking form for any of our training courses listed below. Just click on the links for more information about individual courses. Saturday May 4th – beginners’ digital photography (part 1) – getting off auto mode in the Peak District. The first part of our beginners’ level courses is designed to help you take control of your camera, and get you off the “all-auto” mode. Held at a beautiful rural location near Bakewell. Suitable for all makes and models of digital cameras – from compact cameras to dslrs. Only 2 places still available. Saturday May 11th – Peak District landscape photography course around Stanton Moor. This course will take us to some of the finest bluebell woods in the whole of Derbyshire, just when the flowers are at their best. Plus a mine engine house, stone circles, quarrying remains and impressive sandstone outcrops to photograph. Not to mention lunch in a great little pub! Saturday May 18th – beginners’ digital photography (part 2) – getting creative in Monsal Dale in the Peak District. The morning will be spent trying out long exposure techniques with the impressive weir, and the afternoon at a different location nearby, chosen according to the light conditions on the day. Saturday May 25th – Peak District landscape photography course in the White Peak. Timed to coincide with the hay meadows looking at their best, this course will include both landscape and some close up photography. Saturday June 1st – beginners’ digital photography (part 1) – getting off auto mode in the Peak District. The first part of our beginners’ level courses is designed to help you take control of your camera, and get you off the “all-auto” mode. Held at a beautiful rural location near Bakewell. Suitable for all makes and models of digital cameras – from compact cameras to dslrs. 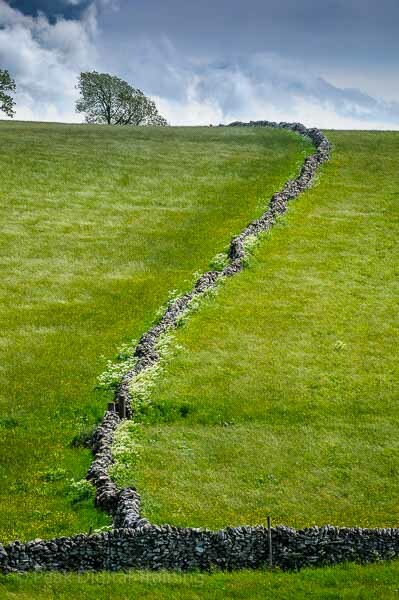 Saturday June 8th – beginners’ digital photography (part 2) – getting creative in Lathkill Dale in the Peak District. Half the day will be spent photographing the weirs and waterfalls, and for the rest of the time we will be in the top part of the dale with its beautiful limestone scenery and spectacular wild flowers. Saturday June 15th – beginners’ digital photography (part 1) – getting off auto mode near Sheffield. The first part of our beginners’ level courses is designed to help you take control of your camera, and get you off the “all-auto” mode. Suitable for all makes and models of digital cameras – from compact cameras to dslrs. 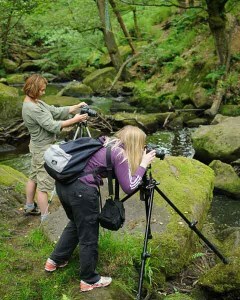 Saturday June 22nd – Peak District landscape photography course in Lathkill Dale. A midsummer day in one of the most beautiful dales in the White Peak. Numerous weirs and waterfalls, spectacular wild flowers, wildlife, mining remains and limestone cliffs. Timed to coincide with the rare and beautiful Jacob’s Ladder being in flower. Always a very popular location. Saturday July 13th – beginners’ digital photography (part 1) – getting off auto mode in the Peak District. The first part of our beginners’ level courses is designed to help you take control of your camera, and get you off the “all-auto” mode. Held at a beautiful rural location near Bakewell. Suitable for all makes and models of digital cameras – from compact cameras to dslrs. Saturday August 3rd – beginners’ digital photography (part 1) – getting off auto mode near Sheffield. A day out on the moors as the heather come into bloom, turning them purple. This course is designed to help you take control of your camera, and get you off the “all-auto” mode. Suitable for all makes and models of digital cameras – from compact cameras to dslrs. Saturday August 10th – beginners’ digital photography (part 2) – getting creative near Sheffield. A full day out on the moors as they turn purple with the blooming heather. Photographing waterfalls, abandoned millstones, gritstone rock outcrops and more! Saturday September 7th – beginners’ digital photography (part 1) – getting off auto mode in the Peak District. The first part of our beginners’ level courses is designed to help you take control of your camera, and get you off the “all-auto” mode. Held at a beautiful rural location near Bakewell. Suitable for all makes and models of digital cameras – from compact cameras to dslrs. Saturday October 5th – beginners’ digital photography (part 1) – getting off auto mode in the Peak District. The first part of our beginners’ level courses is designed to help you take control of your camera, and get you off the “all-auto” mode. Held at a beautiful rural location near Bakewell. Suitable for all makes and models of digital cameras – from compact cameras to dslrs. Saturday October 12th – sunset and night photography in the Peak District. An advanced level course timed to coincide with a full moon – a relatively easy introduction to night photography. Held at a fantastic rural location with great subjects, wide horizons and relatively little light pollution. If none of these courses are convenient for you, and you would prefer training on weekdays, why not book some bespoke one to one training at a time and place to suit you? Saturday May 4th – 10.00am to 5.00pm. Only 2 places still available. Each of these courses is limited to just 6 places, which cost £90.00 per person. Please contact us to request a booking form for any of the above dates. If you want to learn how to get beyond the “point and shoot” phase with your digital camera, but are confused by its complexity, join us on one of these digital photography courses for beginners in the Derbyshire Peak District. No matter what type of digital camera you use – compact, bridge, mirrorless or digital slr – on these one day workshops you will learn solid, practical photographic techniques that will be relevant not only to your current camera, but also any other type of camera you may own in the future. You will learn how to take control of your camera’s basic settings for exposure using shutter speeds, lens apertures and ISO, and adjust colour and focus to ensure you get more consistent and predictable results more of the time. You will also be given a printed sheet for your particular make and model of camera, telling you in plain English exactly how to adjust the most important settings that we will be learning to use on the day. You can see further details of exactly what we cover on both parts of our photography courses for beginners here. Posted in news	| Comments Off on Beginners Digital Photography in the Peak District (Part 1) – Getting off Auto Mode. These courses are being held in the Peak District close to Fox House on the edge of Sheffield, and are accessible by public transport. Each course is limited to a maximum of 6 people, with places costing £85.00 per person (not including lunch). See here for details of what is covered on each part of our beginners’ photography courses. Beginners’ Digital Photography (Part 1) – Getting off Auto Mode. Saturday June 15th – 10.00am to 5.00pm. Saturday August 3rd – 10.00am to 5.00pm. On both of these courses, we will be enjoying a day of outdoors photography in a very accessible area with a great variety of subject matter. These courses are suitable for all makes and models of digital cameras, and everyone attending will receive a printed sheet listing the most important controls and menu items on their particular make and model of camera, explaining in plain English what they do and – most importantly – exactly how to set them. While learning how to take control of your camera and get off the “auto” and “scene” modes, we will have fun photographing water, abandoned millstones, rock formations and much more. As an added bonus, the heather will just be coming into flower for the course in August! There is little walking involved on these courses, and lunch will be in a local tearoom or pub (or you can bring a packed lunch). There will be a maximum of only 6 people on each course, and places cost £85.00 each. Please contact us if you would like a booking form. We also run this course on various dates from May to October not far from Bakewell in the Derbyshire Peak District. See here for further details of our beginners’ photography courses in the Peak District. Beginners’ Digital Photography (Part 2) – Getting Creative. Saturday August 10th – 10.00am to 5.00pm. The area around Fox House is one of the prime spots for photographing heather in the whole of the Peak District, and this course is timed to catch it at its peak – when the moors will be turned purple and looking at their very best. We will divide our day between a sheltered little valley photographing waterfalls for practising long exposure techniques with moving water. 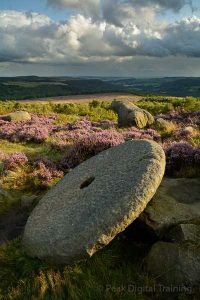 After lunch in a local teashop or pub – where we will have a chance to look at the morning’s work on the laptop – we will head out onto the moors (weather permitting) to photograph the gritstone edges and abandoned millstones. A tripod will be necessary for this course, but we will be able to lend you one if you don’t already own one. A range of filters will also be available for you to borrow on the day. These courses are accessible via public transport from Sheffield. Please contact us to request a booking form, or if you need any further information. We also run this course in other parts of Derbyshire and the Peak District. You can see more details of all our beginners’ digital photography (part 2) courses here.